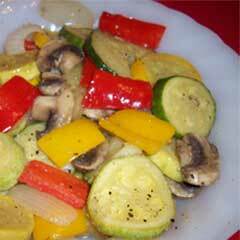 This side dish is a wonderful way to get your veggies and is so very tasty. Heat olive oil in a large skillet. Add all the chopped vegetables except mushrooms. Sprinkle seasonings over the vegetables. Cook approximately 20 minutes until almost tender. Add mushrooms and cook another 10 minutes. Variations: Combine different varieties of squash. If you want more spice, add some Sichler Farms green chile.